The AIIM community has a special interest in digital transformation. Members have made huge content and systems investments. 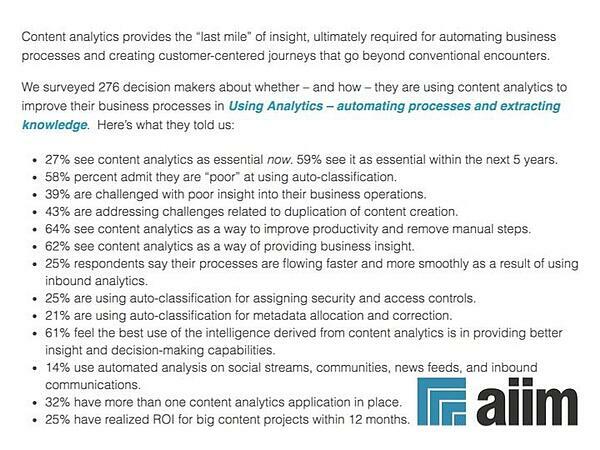 A 64% majority see content analytics as a way to improve productivity and remove manual steps, according to AIIM research, and 62% see content analytics as a way of providing business insight, hence my Content AI talks at this year's AIIM Leadership Council summits in Raleigh, NC and London. I looked at how artificial intelligence extends your ability to exploit all content types, at volume. I'll point AIIM readers to my deck and retrace key points in this article. Of course, we've been digitizing content and delivering electronically -- and wrestling with metadata, search, information governance, and compliance -- for decades. What's new is the explosion of mobile and social data and Internet of Things. What's transformative is the rise of machine learning at scale. Digital transformation is enabled and impelled by data sources, technologies, and capabilities that didn't exist ten years ago. The 2017 AIIM research found that 27% of respondents see content analytics as essential now, and 59% as essential with five years. I define analytics as the systematic, repeatable application of algorithmic methods to derive and deliver information, typically expressed quantitatively, from source data. Analytics outputs may be delivered as indicators, data tables, visualizations, and models. Machine learning (ML) is about data-discovered models. ML contrasts with traditional top-down, engineered approaches. The old way relies on taxonomists and business analysts to construct structured information-management approaches. 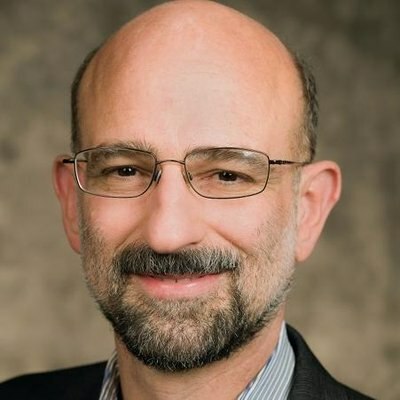 The new way applies analytics to exploit everything exploitable in available data, to detect new insights and stay ahead of trends, and to understand and respond to actual (rather than assumed) utilization. Machine learning and neural (deep learning) methods in particular can identify previously-unseeable patterns in transactional data and tracking data. These technologies can extract diverse information from text, voice, images, and video, that is, from unstructured sources, that was inaccessible with established methods. You can get more out of data: the objects and activities caught in a photo, for instance; emotion signals in a corporate earnings call; and behavioral and journey models that capture device use, content consumption, and consumer experiences: interactions and conversations. If you work for a content-rich organization, you're in luck: You now have a broad choice of cloud and on-premise tools that will tag, classify, and extract information from your content. Or if you work for a solution provider, you have options for building new, better, machine-learning based functions into your products. Semantic search - delivering results based on the contextual meaning of search terms and based on attributes, properties, and relationships. Question answering - providing definitions, facts, computed results, and visualizations that respond to the questioner's intent. Machine translation - taking into account context and idiom, including for less-common languages. Conversational interfaces - whether voice or text based, providing new, automated ways for users to interact with content. The biggest obstacle is a lack of will to disrupt established work practices and replace entrenched, antiquated technologies. But there's a catch. Data & content usage rights: in particular for secondary uses such as advertising, and protections given the highly sensitive nature of data collected nowadays. Algorithm validation and robustness: "Overtrained" models can be notoriously brittle, and narrowly focused AI breaks easily in unanticipated situations. System verification: Did the developers get it right, noting that machine-learned models can be opaque to all but experts? Training bias: Did you build your models from truly representative data, or did you training-data choice build bias into your systems? Certain issues are particular to machine-learned models and data-driven AI, while others also apply with engineered methods. Take a particularly glaring recent example: I'll quote a Reuters news story, "Amazon scraps secret AI recruiting tool that showed bias against women." Amazon is amazingly innovative but made a basic mistake in its choice of recruiting training data. Think of the diversity of errors your organization could make -- given your data, operational needs, and technical capabilities -- that would escape quick notice because of the difficulty of validating, verifying, and explaining an ML-built system. I'd say that trust concerns can be addressed, especially as competitive pressures have us on a forced march toward machine learning, process automation, and ultimately content AI. My best advice is to keep in mind the need for careful attention to training data, algorithm choice, and evaluation and testing. Also, look for reliable technologies and technology providers and if needed, implementation partners. If you succeed, AI can be an enabler of digital transformation and provide greater insight, better decision making, improved productivity, and higher ROI. Seth Grimes consults on product and market strategy to text analytics and natural language processing (NLP) providers and users.